Lexus has added a new F-Sport grade to the CT 200h range, with beefed up styling, revised suspension and extra standard equipment. It’s available to order now, priced from £27,850. There’s a larger rear spoiler, flared side skirts, mesh grille, more aerodynamic bumpers and dark finished 17-inch alloy wheels. The interior has been restyled too, with F-Sport steering wheel, black leather upholstery, heated front seats, and aluminium pedals and scuff plates. There’s also standard cruise control. That equipment is added to the current SE-L grade, so buyers also get a rear parking camera, auto-dimming retractable door mirrors, and electric seat adjustment. Suspension has been overhauled to provide a more dynamic and engaging drive, and lateral dampers have been added to further enhance the driving experience without compromising comfort. Performance figures are the same as the rest of the range, with emissions of 94g/km and combined cycle economy of 68.9mpg. 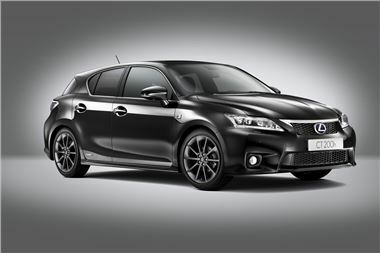 As with the rest of the CT 200h models it can run up to a mile on electric power alone. First deliveries are expected in January.